For 14 seasons, the league that won the All-Star Game was awarded homefield advantage in the World Series, but thankfully that will no longer be the case. This story appeared in the Dec. 12, 2016 issue of SPORTS ILLUSTRATED. To subscribe to the magazine click here. Major League Baseball has a new five-year, $98 trillion, 497,678,322-page labor agreement, and I can’t wait to settle in and read it by the fireside. Early reviews are glowing. Apparently the plot heats up when commissioner Rob Manfred peels off a pair of stirrups and coos, “Come swim in my international bonus pool, baby,” though the tome lacks the comic brilliance of the last labor agreement, which declared, quite hilariously, that the All‑Star Game meant something. That charade is over. As part of the agreement, the All-Star Game will no longer determine home field advantage for the World Series. Thus ends an experiment that was inspired by a game that never ended. In 2002, both All-Star teams ran out of pitchers and the game was called a tie after 11 innings. Fans in Milwaukee were absolutely furious that they had to walk out without knowing who won, though that would probably improve their mood after most Brewers games. 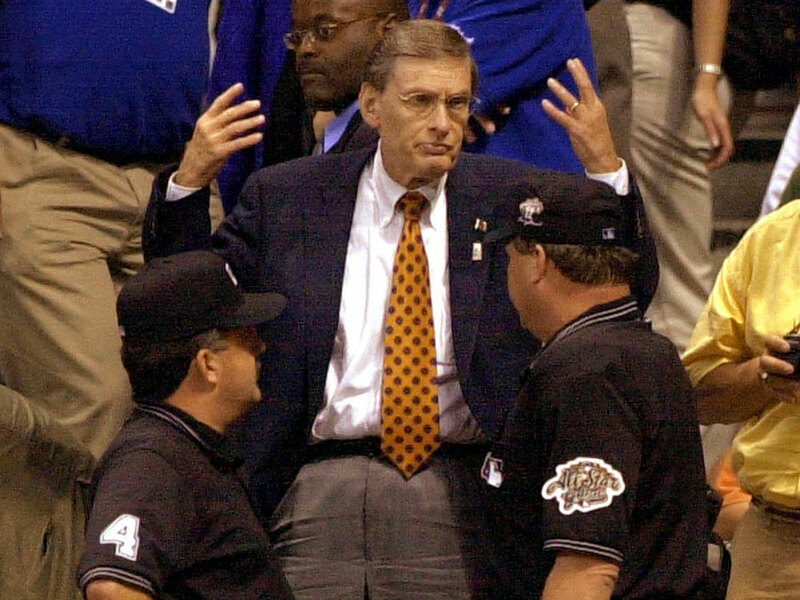 Bud Selig, then baseball commissioner, responded to the outrage by declaring that, starting in 2003, the All‑Star Game winner would get home field advantage in the World Series. This was an odd reaction to teams running out of pitchers, like performing open-heart surgery on somebody whose car ran out of radiator fluid. Selig could have just done what everybody in Milwaukee does on a Saturday night and order more pitchers. But Selig was the commissioner, and he loved baseball, and almost everybody liked Selig, and so he announced in an All-Star Game press release this time it counts, and the players responded with their own press release, which read, hahaha—what? you can’t be serious. MLB never could get players to chase the carrot. And I could never fault the players for it. If you pulled your groin 162 times a year, would you volunteer to do it once more? The old system of alternating home field advantage between the American and National Leagues made no sense either, but at least nobody was trying to trick us. That’s what the “meaningful” All-Star Game felt like: a trick. You can’t snap your fingers and turn an exhibition into a meaningful sporting event. Every year, most All-Stars knew they wouldn’t play in the Series anyway. Pitchers were wary of throwing too much in a game that didn’t affect the standings. Managers wanted to give every All-Star a chance to play. Meanwhile, MLB continued to select starters by fan voting, and continued to mandate that every team get at least one All-Star. So the game was oh-so-very-important, but the participants were chosen based on popularity and geography. You could not send a more mixed message if you wore an i’m with her shirt and a make america great again hat. During the 2008 All-Star Game, Alex Rodriguez asked the question that helped to make him an all-time great: “How can I turn this into an embarrassing headline?” He left the All-Star Game before it ended, which was a problem since 1) it was at Yankee Stadium, 2) he played for the Yankees, and 3) by then, every New York tabloid had six reporters following him. The only surprise was that when A-Rod left the stadium, he did not immediately crash into the media shuttle. There are two lessons here. One is that you cannot force a person to care. The other is that if you’re going to try to fool Americans with a marketing gimmick, it shouldn’t be such an obvious marketing gimmick. Some day perhaps we will write books and make documentaries about Those Times It Counted, Sort Of. In the meantime, baseball is going to a more logical mechanism for determining home field Series advantage: It will go to the team with the best record. This means that if the best teams in the AL and NL each have 98 wins heading into the season’s final weekend, they will know they are playing for home field advantage in the World Series. And we all know what they will do then: rest their starters and set up their rotation for the Division Series. Ah, well. Onward we go.